While my daughter was engrossed in digging through the sand, I quietly lounged next to her on the beach mat – legs outstretched, sunglasses on, with only the sound of my thoughts in my head. Since R’s birth, moments such as these, where I have time with my own thoughts, not concerned with the million things I need to do, are few and far between. As the waves crashed on the shoreline and the sea planes and birds flew above, I thought to myself, “this is my life”. Not too shabby, I know, but I have struggled with the decision to stay at home. I had never imagined that I would stay at home with my daughter. I am an incredibly passionate teacher and have always pushed myself to be the best teacher I could possibly be. Giving that up was not easy. During the first 13 or so months of R’s life, she struggled terribly with reflux. At any given moment, we fearfully anticipated the arrival of the massive stream of regurgitated food; trying to contain it before it covered every surface in a moderate radius. With this fear, brought isolation. We didn’t go out much because she would inevitably vomit – in the car, on me, at a restaurant, at someone’s home, anywhere really. I extended my leave from work to continue to be with R.
When she turned 14 months old, I was determined to make a change. I wasn’t happy – she wasn’t happy – something needed to be done. 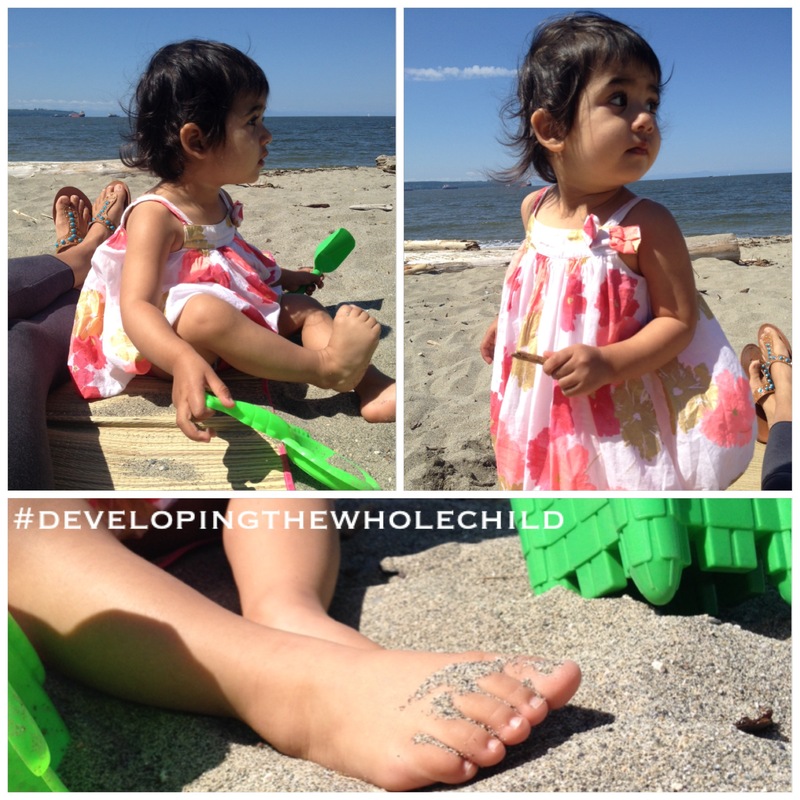 I needed to teach; R needed to grow – so began our journey into developing the whole child! Though there are still difficult days, I take joy in the gentle smiles and joyful squeals as I work each day in my classroom of one. The walls of this classroom may look different than what I am used to, but I know that I am still inspiring and molding a young mind, just as I have done so in the past. We really are so lucky to have the honor if spending our days with these little ones, pouring our hearts into their development and well being! I agree! It’s so wonderful to have the option! Thanks so much for the kinds words, Sara!! It definitely makes it all worth it knowing that I am doing something that makes her so happy. I’m so incredibly proud of you being able to take a situation and turn it around to suit what serves you best… your passion for teaching. It’s such an inspiration. Your R is truly blessed to have you as a mom. You are so hard working, loving and caring and it shows with the words from your heart and the photos. You are investing in one of the most important people in your life; that’s just beautiful. Thanks so much for sharing your experience, your tips and tricks. This is a website that I have saved and stared in my favorites. Thanking you in advance for sharing your life. Thanks so much for your kind words, Samar. Seeing R’s smiles and joy while we spend the day together, makes it all worth it! Wow the you’re doing are truly amazing! It must take lots of effort and dedication. R is very lucky to be in a classroom of one. 🙂 When M is more able, maybe we could join your cool activities some time? Hi Joy! Thank you so much! I would love for you and M to join us! I can even adapt activities so that M can join us sooner! I just teared up reading this! I love the “classroom of one”. Such a perfect way to view it, as a passionate teacher and mama. I also had a very “barfy” baby. I can completely relate to the stress, worry and lack of control of the situation. Love what you’re doing here Raman! Thanks, Holly! It’s always encouraging hearing that other moms have gone through similar stuff and have made it through! It’s easy with little ones for things like this to result in us becoming captives in our own lives. My son screamed so much when he was a baby people used to stop me in the street to tell me something was wrong with him. (Yep, allergies and eczema thanks). It was quite isolating and a tricky balancing act to get right – staying in isolation at home with all of the attendant cabin fever that created or going out and having to deal with the drama. Finding that sense of purpose when there’s less control over a situation is definitely a great way to find acceptance in the situation. Good on you! Thank you for sharing your experience with me! It was definitely tough taking my daughter out knowing that there would be judgemental eyes! It has been a journey, but we came out the other side and are both happier! Love what you did with your situation. Great post. Inspiring! This is lovely! Your daughter is beautiful! It is so wonderful to have moments such as yours on the beach. It really is special. We do what we gotta do and from the looks of it, you are doing a wonderful job given the situation. What a great reminder that it’s better to look at the positive side of things rather than dwell and pine for things that are not to be at the moment. I completely agree. Life is so much happier for all of us when I focus on the positives! Thanks so much! Her reflux is much better and only bugs her from time to time now. The blog has been a great experience for me and I’m happy to hear that others are enjoying it as well.